Armed with sticks, rocks and bottles, a mob of angry Mexicans in Cancun attacked a Russian man who allegedly had made a habit of posting online videos with racist content. On Friday night, a crowd of approximately 50 people cornered the man outside his residence and started throwing things at his windows and at one point made their way into the house. Aleksei Makeev, 42, was eventually rescued by police with severe injuries. During the bloody standoff, Makeev allegedly stabbed and killed one of his attackers. 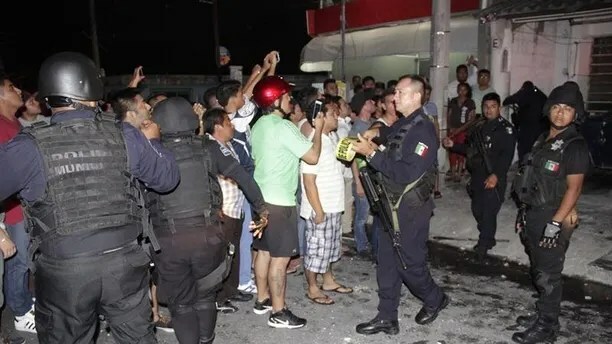 According to Guillermo Brahms, secretary general of Benito Juarez municipality, which encompasses Cancun, the stabbing prompted the mob to grow and the violence to escalate. Makeev is currently in a drug-induced coma, according to reports, after undergoing surgery following a traumatic brain injury and wounds to the forearms and back. If he recovers, he will likely face murder charges. The man was living in the Caribbean resort area since at least 2015, when he was fired by the tour company he worked for because of aggressive behavior. Blurry footage of the attack circulated widely on Mexican media on Saturday. In one clip, assailants can be heard shouting “You’re going to die” and “I’m going to cut your head off” as they closed in on the Russian. Police in Cancun restrain an angry mob that attacked Ukrainian citizen Aleksey Makeev (not pictured), who became notorious for filming himself shouting insults at Mexicans and uploading the videos to YouTube. The crowd demanded Makeev’s removal from the country. The Quintana Roo state Attorney General’s Office confirmed that Makeev had been arrested on several occasions for violent behavior, including by immigration officers, but said he had not been deported because he is a legal resident. In the videos, some of them seemingly shot by Makeev himself, the man can be seen insulting people in public places in Russian, English and Spanish. In one of them he walks toward a group of teens eating a pizza on the beach, steps on their food and walks away. Some of the videos include the hashtag “Lord NaziRuso,” and in some others he spoke against a backdrop of swastikas. Reuters and EFE contributed to this report.